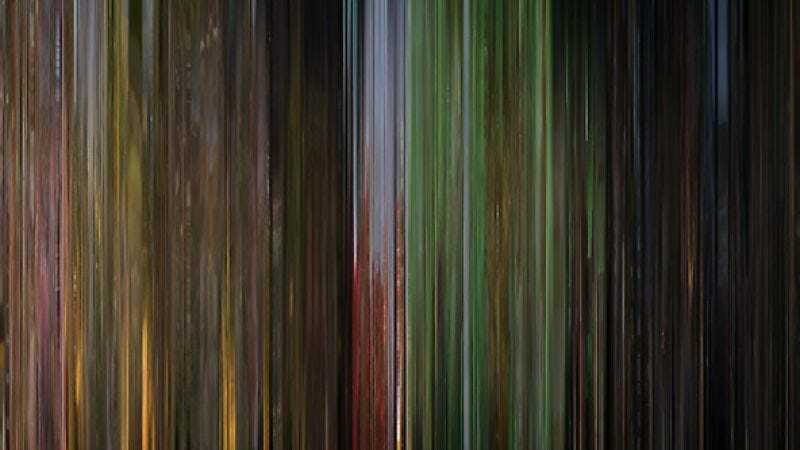 Movie Barcode is the work of an anonymous Tumblr user who takes every frame from a film and condenses them all down to a single pixel’s worth of color. Laid out in a single rectangular box, the results take on a form that, while abstract, is evocative of the tone of the film at hand. Sometimes, it even seems to be outright tracking the actual beats of a familiar story, as in this “barcode” of The Wizard of Oz. That’s no surprise, especially since directors of live action—and especially animated films—put a lot of thought into color palette and grading. It’s also what makes the project work not only as an interesting art experiment, but an insight into the filmmaking process. Take the site’s version of Dune, for instance, which conjures up the feel of David Lynch’s odd, ethereal foray into science fiction. Movie Barcode doesn’t content itself with single films, however, branching off into cataloging entire series with this methodology. You can see both the Star Wars trilogy and hexalogy, and even the collected works of Wes Anderson (below). You can also buy prints, if you find yourself particularly taken with one of these pieces.